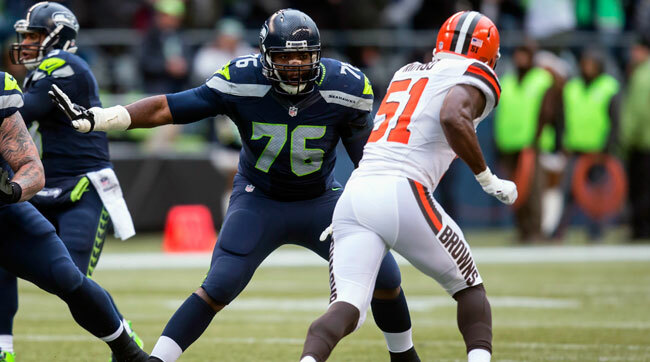 Former Seahawks tackle Russell Okung negotiated his own free-agent deal with the Broncos, learning the hard way that there’s a difference between "Show me the money!" and "Guarantee me the money!" Among the dozens of striking free-agent contracts completed over the past two weeks—it’s hard to believe free agency is only two weeks old—the one that has received perhaps the most scrutiny is essentially a one-year, $5 million deal. Former Seahawks tackle Russell Okung landed in Denver after making the nontraditional decision to assess the marketplace without using an agent. Not surprisingly, the agent community derided this decision. When the details of Okung’s less-than-optimal contract with the Broncos surfaced—he has no guaranteed money—the barbarians at the gate stormed the media fortress. Shunned by Okung, agents put on their “sources” hat to communicate through the media that players are neither skilled nor sophisticated enough to deal with NFL management. It is understandable in today’s NFL for rookies to negotiate without an agent. Because the current CBA has effectively prefabricated all rookie contracts, a rookie knows exactly what he is going to make the moment he is drafted. For veteran free agents, however, there are many more variables. In these cases, the maximum agent fee of 3% can be a smart investment. Okung was dealing with the fallout of a dislocated shoulder he suffered in the divisional round of the playoffs. With such a serious and recent injury, he was not going to receive a top-tier free agent tackle contract; teams were going to demand a one-year deal or a structure to reflect his injury, with or without an agent doing the negotiating. And Okung certainly found that to be the case in the marketplace. Tackle Russell Okung (76) negotiated his own free-agent deal with the Broncos after playing the first six years of his career in Seattle. In talking to someone close to Okung (not an agent), I found the most interesting part of his free-agency experience was that the team he ended up with never contacted him. Rather, Okung called the Broncos. Before that, Okung had drawn primary interest from three teams: the Giants, Steelers and Lions. It appears that two of them, the Giants and Steelers, loosely discussed contract parameters without making firm offers. Perhaps those teams were convinced that Okung would return to them after finding a soft marketplace with hat in hand. The Lions showed the most concrete interest and offered a similar first year to what he eventually signed in Denver (albeit with more security): $1 million signing bonus, $1 million guaranteed salary, $2 million of per-game roster bonuses and $2.5 million in playing time and playoff incentives. Not overjoyed with either the marketplace or the prospect of signing with Detroit, Okung started reaching out to other teams. He preferred to stay close to the West Coast, having played his entire career in Seattle, and noted the Broncos’ culture of success, Ryan Clady’s uncertain status and the team’s desire last year to acquire Joe Thomas. Okung negotiated with the Broncos from a position of weakness because he pursued them, and wrangled a deal that became heavily criticized: a two-part contract with a realistic first year followed by option years at a much higher level. The first year consists of a $1 million bonus for completing 90% of the team’s offseason workouts, followed by a $2 million roster bonus for being on the team in Week 1 and a $2 million salary. It also includes $3 million in playing time incentives: $1.5 million for 80% and another $1.5 million for 90% (Okung played 79% last year). The worst-case scenario for Okung is that he earns $1 million for participating in the Broncos’ offseason workout program and is released before training camp. Most likely, Okung will make somewhere between $5-8 million this season with the Broncos, the team of his choosing. Next year, he will either trigger the “second contract” with the Broncos at a much higher level—it averages $12 million over four years—or become a free agent again. The contract is certainly not as “end of the world” as the agent community would have us believe, but there are some deficiencies. The deal’s overall structure—a one-year “prove it” concept followed by an option for additional years at a much higher level ($12 million average)—is common among NFL player contracts. Whether through a second-year option, roster bonus, or simply a large salary, the vast majority of veteran deals are really year-to-year propositions, with the risk moving from the team to the player. Even the largest contract in terms of overall value this year, Joe Flacco’s, has no guaranteed money after this season. Further, the structure of an option after a “prove it” year is not uncommon for players coming off an injury such as Okung. Indeed, a free-agent quarterback named Drew Brees received a similar deal 10 years ago as he returned from a shoulder injury. Having said that, I am not sure why Okung did not simply agree to a one-year deal. I understand his thinking: the $12 million average over the subsequent four years is impressive, and perhaps more than he could get as a free agent next year. However, he has handed the team the total discretion over his future. If he struggles, they will cut him, but if he performs as a top tackle, he has lost the opportunity to enter the market again without the stigma of injury. A one-year deal, in his situation, may have been preferable. As to the one-year deal, it should have had some “early money” to ensure Okung’s presence on the team this year. Although the $1 million workout bonus—payable after the offseason program is completed in June—is “practically” guaranteed, Okung should have requested/demanded immediate commitment (through a roster or signing bonus) rather than having to wait until after the workout program. He should have held firm in requiring some of or, ideally, the entire $2 million September roster bonus due and payable for being on the roster now, not when the season begins, which would ensure his presence on the team beyond the workout program. The Broncos may have resisted, but some compromise of that $2 million could have been forged through negotiation. Further, with this relatively low compensation level, the playtime incentives start at far too high a threshold (80%). Contract negotiations ultimately are less about money than they are about risk allocation. In this contract, Okung takes the vast majority of the risk. An agent could have been firmer in being the “bad guy” in not agreeing to a contract until there was less risk to the player. Okung’s situation brings back vivid memories for me of agent-less negotiations I had while negotiating on behalf of the Packers. As a former agent and friend to many players, a few players trusted me to negotiate directly with them without the use of an agent. In retrospect, I found these negotiations as difficult as any. The Broncos’ contract negotiator, Mike Sullivan, is a former agent (he negotiated Aaron Rodgers’ rookie contract with me). Even though Okung approached him, he and the Broncos do not want Okung hearing how team-friendly the deal is. That perception will affect the team’s relationship not only with Okung, but also with other players. Again, the deal is not as bad as the agent community would have us believe, but the internal relationships here bear watching as the contract continues to be ridiculed in league circles.